The triple-bill Caudog Records Showcase Rock Show! comes to LiveWire on March 18. Christopher David from the Chicago alt rock band Magatha Trysty has a release party for The Houdini Tapes tomorrow night, February 27 at The Elbo Room on Lincoln Avenue. Whitewolfsonicprincess will be performing tomorrow night, February 27 at Silvie’s on Irving Park Road in Chicago. 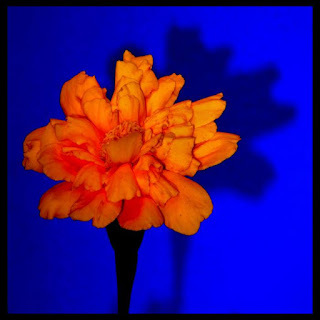 It’s not a release party for their new Shadow Of The Marigold album (which I reviewed here this past Tuesday) but according to a Facebook post from band member James Moeller, they will play at a few songs from that intriguing effort. The Neverly Brothers will be bringing their musical history show to Durty Nellie’s in Palatine on March 5. The 1950s/‘60s cover band has a double CD that it has been selling at its gigs. C2E2 (Chicago Comics and Entertainment Expo) arrives earlier in 2016 than it has in previous years. It runs from March 18 through 20 in the South Building at McCormick Place on Lake Shore Drive. Actor John Cusack, best known for his roles in Love And Mercy and High Fidelity, is among the guests, along with Melissa Benoist from Supergirl; Edward James Olmos and Mary McDonnell from Battlestar Galactica; John Ratzenberger from Toy Story and Cheers (he was also on that James Burrows TV tribute); and D.B. Sweeney from the White Sox movie Eight Men Out. The Summer Cannibals, a Portland-based garage rock band that takes its name from a Patti Smith song, will release its third LP Full Of It on the Kill Rock Stars in late May. Fans can listen to the first single “Go Home” on the Spin magazine website. In addition to the Sons Of The Silent Age tribute to David Bowie at Metro next Friday, there are two Tributosaurus shows honoring him at Martyrs’ next Wednesday, and they’re both sold out. More Bowie songs will be on tap at the Caudog Records Rock Show! on March 18 at the LiveWire Lounge on Milwaukee Avenue. 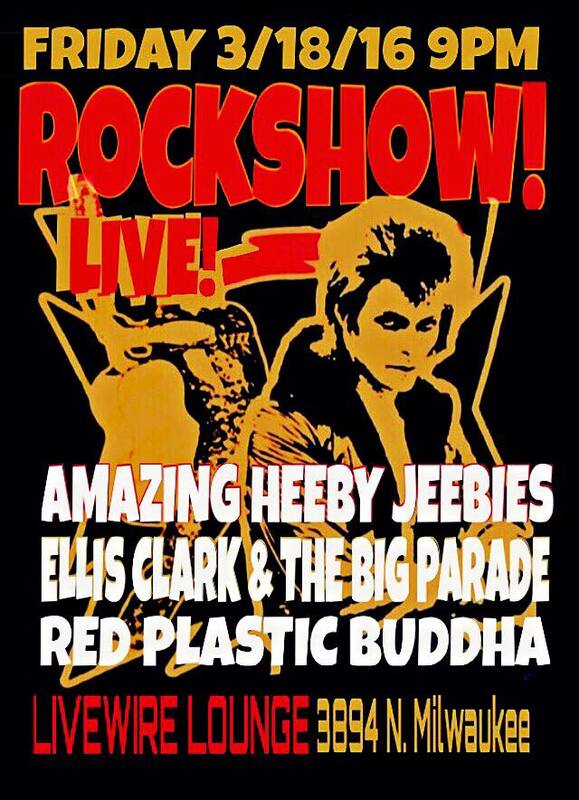 The event’s Facebook page promises, “You’ll hear some Bowie tunes, originals, and see a spectacular rock show! 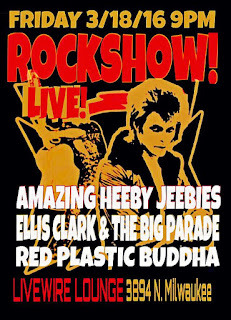 !” The triple bill features The Red Plastic Buddha, Amazing Heebie Jeebies, and Ellis Clark and The Big Parade. On yesterday’s post, I mentioned a new cover of David Bowie’s “Ziggy Stardust” by Sendelica on seven-inch vinyl from the Fruits de Mer label. American band Proud Peasant is also going the seven-inch colored vinyl from FdM route. Their cover of “Daybreak,” originally by a band I’ve never heard of called Eloy and the Manfred Mann’s Earth Band’s “Saturn, Lord Of The Ring/Mercury, The Winged Messenger,” is due out April 6. The UK-based indie label also has a four-song single from Italian singer-songwriter Claudio Cataldi due out that day. There’s only one week left to check out The Hypocrites theater group’s staging of local actor Hans Fleischman’s inventive and critically acclaimed take on The Glass Menagerie at The Den Theatre. It runs through March 6. Fleischman’s version of the Tennessee Williams play was a huge hit for the Mary-Arrchie Theatre a few years back. Time is also running out for anyone who wants witness Mary-Arrchie Theatre’s final production— a staging of David Mamet's American Buffalo. After March 6, the Mary-Arrchie, after 30 years of providing some of Chicago’s best storefront productions at its Sheridan Road home, will cease to exist. Although there is talk that Mary-Arrchie will hold a final Abbie Hoffman Died For Our Sins festival at some other venue in August. Chicago rocks! Tickets go on sale tomorrow for Cheap Trick's April 1 gig at Metro, and for Wilco's outdoor, all-ages concert on August 21 in Millennium Park. The upcoming dates I am most looking forward to at City Winery - Chicago are when Graham Nash is there on May 11 and 12, but the venue also recently announced a Cracker gig on May 14, and a movie/dinner combo on March 9 featuring Labyrinth with David Bowie. This is just five days after Sons Of The Silent Age and special guest Ava Cherry will celebrate the 40th Anniversary of Bowie's Station To Station by performing the entire album, along with and several of his hits at Metro. 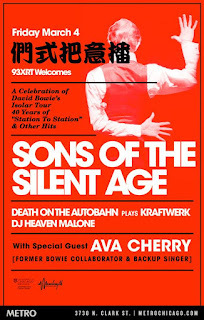 Also on bill are Death On The Autobahn, performing the music of Kraftwerk; and DJ Heaven Malone. Tickets are $19 in advance, $21 at the door, and a portion of the proceeds will benefit Cancer Research at the University of Chicago Medical Center. In other Bowie News, the UK vinyl-only indie label Fruits de Mer will release a limited-edition 7-inch 45 of the Welsh prog rock band Sendelica delivering a seven-minute, spaced-out rendition of “Ziggy Stardust” on April 6. The “Australasia Remix” on the B-Side is a half minute longer. The songs were recorded before the iconic singer passed away. Somewhere in the Brokenhearted Toy archives there’s another Doctor Who-related post named Doctor Doctor. I used The Thompson Twins song title as a starting point to explore why David Tennant, then the current actor playing the lead role in the long-running British sci-fi series, was being called the best Doctor since the legendary Tom Baker. When Tennant later announced he was leaving the show, it was hard to see how anyone could replace him. I couldn't have known then (without using a TARDIS) that his successor Matt Smith would bring his own distinctive style, and become a social media sensation, along with The Ponds, played by Karen Gillan and Arthur Darville. Smith’s take on The Doctor was as different from Tennant’s as Tennant’s was from Baker’s, and yet it was easy to believe that all three were the same character. Smith and Tennant exuded a great chemistry when they joined forces on the 50th Anniversary Doctor Who Special Day Of The Doctor. 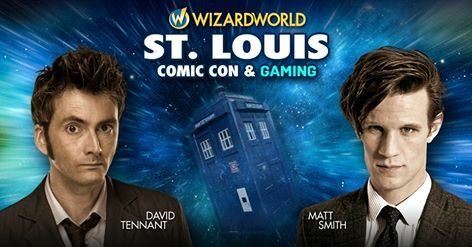 So fans attending the Wizard World Comic Cons in New York, NY; Madison, WI; and St. Louis, MO will be in for a treat when Smith and Tennant appear in what’s being billed as their first time together at this type of event. Maybe these Wizard World Comic Con appearances could spark some ideas about how to channel the energy they conjured on the Doctor Who special into a feature film adventure/comedy. And, here’s hoping they’ll also be at the Wizard World Comic Con - Chicago when it arrives here in mid-August. This is the third release from the Chicago-based Whitewolfsonicprincess, but vocalist-percussionist Carla Hayden and vocalist-guitarist James Moeller have also been performing with their avant garde theatre group Black Forest for several years. Back when they started the band, it seemed more like a side project since it offered an off-kilter approach similar to their stage productions. With help from musicians like guitarist Victor Sanders and bassist Tim O’Brien, who adroitly bring elements of jazz, blues, and classical, Whitewolfsonicprincess has evolved into its own entity. The Shadow Of The Marigold is a brooding though engaging effort, filled with sacred and destructive imagery. Hayden sings of “thorns and thrones” on the acoustic-based title track, and observes, “The people are broken now/Spirits in the lost and found.” On “Bathed In Black,” Moeller leads us into apocalypse where, “The stars are falling around our heads” and “The earth has decided to halt.” The bluesy “Paralyzed” uses a handful of lyrics to express a sense of betrayal, and the hard-edged “Black Dog Running” creates a ritualistic ambiance. The more hopeful “Lavender Rays” evokes Kate Bush, as Hayden—with perhaps her most gorgeous vocals yet—describes a vision while the band envelopes her in a haunting Celtic arrangement. “Roses In The Branches” also strikes a positive note, with poetic references to stars, flight, and charms. It offers a soothing end to this challenging album by putting the universe back in its natural order. Whitewolfsonicprincess will be performing this Saturday, February 27 at Silvie’s on Irving Park Road in Chicago. 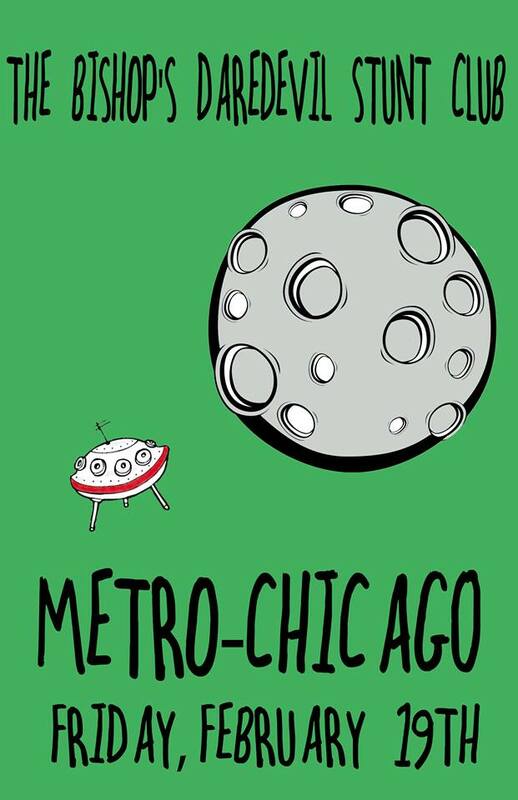 Cheap Trick has just announced they’ll be performing on April 1 at Metro in Chicago. That’s the same day their new Bang, Zoom, Crazy. . . Hello album drops, and it’s seven days before the band gets inducted into the Rock And Roll Hall Of Fame. 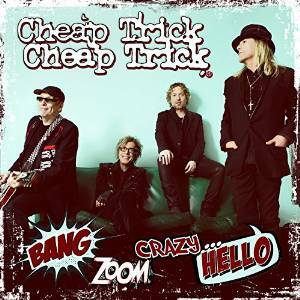 April has been the Official Cheap Trick Day in Illinois since 2007. My recent post about Breakfast With The Beatles returning to its full two-hour format on Sunday mornings on WXRT now that host Terri Hemmert has recovered from surgery included to a link to a video tribute to the Radio Hall Of Fame air personality. Local musicians Eric Howell, Phil Angotti, and Casey McDonough set their get-well wishes to the tune of The Beatles’ “From Me To You,” using clever lyrics and great harmonies. Hemmert has posted the video on her Facebook page, along with some other musical messages that she has received. Angotti has done several tribute shows to famous bands around town, including The Zombies, The Bee Gees, The Monkees, The Kinks, and Simon and Garfunkel. He’ll be performing Tom Petty songs along with the Great Moments in Vinyl cover band tomorrow night at Martyrs’ and he’ll covering The Rolling Stones on at Reggie’s on Thursday. Angotti will be among the numerous artists who’ll be performing when International Pop Overthrow runs from April 14 through 23 for its 2016 Chicago visit. Other IPO favorites who’ll be on hand include Trolley, The Abbeys, Ellis Clark and The Big Parade, The Bon Mots, The Red Plastic Buddha, The Romeros, The Unswept, The Viaducts, The Cells, The Webstirs, The Jeremy Band, and Dave Rave. Chicago area Beatles fans will have to set their alarm clocks for 8:00 AM tomorrow if they want to catch all of Breakfast With The Beatles on WXRT. 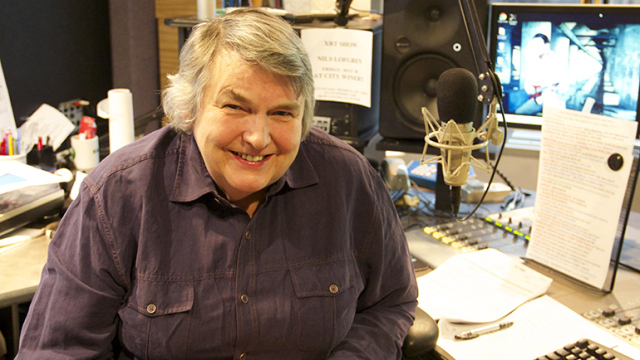 The weekly show can return to its full two-hour self again now that host Terri Hemmert has recuperated from her recent surgery. She had been doing a truncated version (a few were recorded prior to her operation) per orders from her doctors. Tomorrow’s show will be a special tribute to George Harrison, in honor of his birthday. Hemmert, or “Aunt Terri,” as sometimes refers to herself, is also known to local Beatlemaniacs as the longtime official MC of Fest For Beatles Fans when it comes to Chicago each August. She fell in love with John Lennon when she first saw him on The Ed Sullivan Show, and years later, would find herself interviewing Paul McCartney. On Breakfast, she mixes the band’s biggest hits with deep album tracks, along with an eclectic supply of Beatles songs covered by other artists. Listeners are also encouraged to make requests. Another feature of Hemmert’s take on Breakfast With The Beatles (there are other radio shows using that name around the country) involves playing Beatles songs performed by local musicians. Phil Angotti has sent her some inventive cover versions over the years, and he recently joined frequent collaborators Casey McDonough and Eric Howell for a get well parody of “From Me To You.” It’s clever, well-crafted, and a fitting salute to one of the city’s favorite air personalities. Well done, lads, and welcome back, Terri. 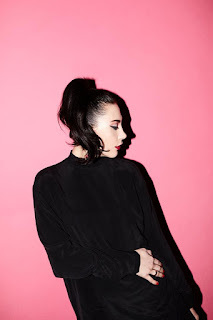 Fans of The Dum Dum Girls will likely be intrigued by the new Kristine Kontrol project from the band's lead vocalist and founding member Dee Dee. The Official Dum Dum Girls Facebook page has more information and a short promo clip. BeatleJuice, the nine-piece ensemble that won the Battle Of The Beatles Bands competition at last year's Fest For Beatles Fans - Chicago, will be performing tonight at Peggy Kinnane's in Arlington Heights. David Drazin, who like me, was a founding member of the Famous In The Future comedy group, will be providing the piano accompaniment when Erich von Stroheim's1924 silent film Greed is shown at the Mary and Leigh Block Museum Of Art in Evanston tomorrow afternoon at 1:00 PM. Creedence Clearwater Revisited will be performing at Arcada in St. Charles tomorrow night. Los Lobos will tap into their impressive repertoire of songs like “Will The Wolf Survive,” “Shakin’, Shakin’, Shakes,” and “Set Me Free (Rosa Lee)” when they perform this Sunday at the McAnnich Arts Center at College of DuPage. They’re sharing the bill with special guests Ballet Folklorico Mexicano. Tomorrow is the last chance to see The Signal Ensemble Theatre’s critically acclaimed production of Heidi Schrek’s The Consultant. The more I listen to the new Shadow of the Marigold CD from Whitewolfsonicprincess in preparation for a review that should post here sometime next week, the more I'm impressed with its stark, inventive imagery and textured arrangements. This is the third effort from the Chicago indie rock band, which is fronted by vocalist Carla Hayden and vocalist-guitarist James Moeller. Whitewolfsonicprincess has a release party for Shadow Of The Marigold next Saturday night at Silvie's Lounge in Chicago. Christopher David from the Chicago alt rock band Magatha Trysty has a release party for The Houdini Tapes coming up next Saturday, February 27 at The Elbo Room on Lincoln Avenue. In my recent review of David's solo effort, I noted that it was a change of pace for him, but still showcased his knack for creating strong melodies and intriguing if sometimes cryptic lyrics. The Gene Siskel Film Center in downtown Chicago is holding a Hollywood On State: Where You're The Star Oscar Viewing Party next Sunday night. 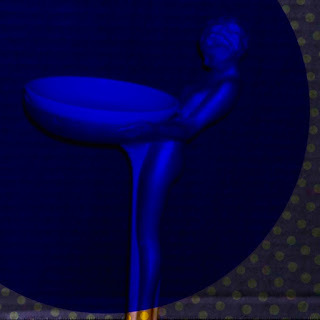 The event opens with a Red Carpet, food and drinks at 6:00 PM, followed by the live Academy Awards telecast at 7:30 PM. General Admission is $100, or $200 for the VIP Lounge. Indie rock band Save The Clocktower will play its first gig of 2016 at the Cubby Bear on Clark Street next Saturday night. I'm hoping it isn't too late to post a reminder about The Bishop's Daredevil Stunt Club being part of a multi-act gig at Metro tonight. It's a big step for a local band that has continued to build a reputation for adventurous power pop over the past few years. Mike Zabrin's Funktastic is the headline act, with Ethan Butler, Brother Starface, and Trick Shooter Social Club also on the bill. The Bishop's Daredevil Stunt Club goes on at 8:30 PM. Admission is $15. I first encountered The Bishop's Daredevil Stunt Club via its clever holiday single “Bad Sweater Christmas Party” back in December 2014. As much as I liked it, I was more impressed by the way the nonseasonal B-Side “Never Be Big Stars” evoked Cheap Trick with a satiric power pop approach. The Bishop's Daredevil Stunt Club released the full-length Rock And Roll Motorcycle Dinosaur in mid-2015, and it was an adventurous album that took off in numerous directions while maintaining an emphasis on irresistible melodies and elaborate vocals. The Cheap Trick influence was still very much in evidence, and it's likely it will be in full force at Metro tonight. 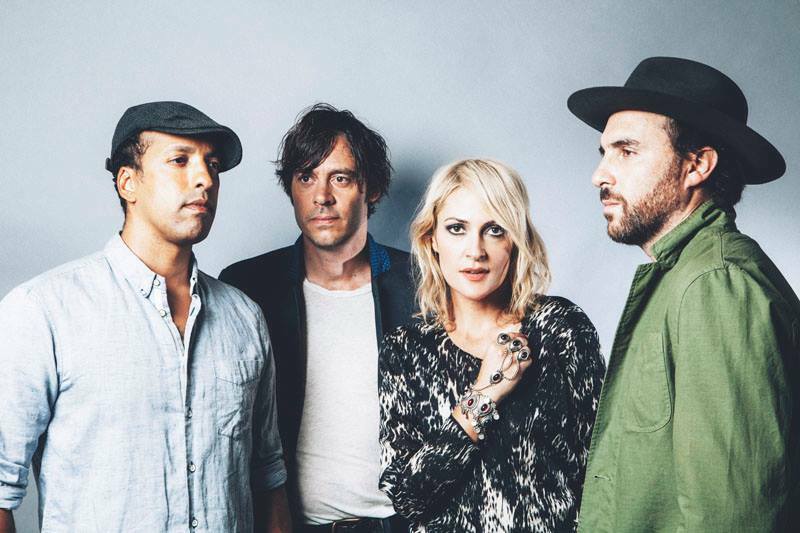 Metric, led by the dynamic Emily Haines, has a gig tonight at The House Of Blues. The band is touring in support of its late 2015 release, Pagans In Vegas. I haven’t heard the new album yet, but if it carries on the catchy but abrasive synth rock tradition of Synthetica, Fantasies, and Live It Out, it should be interesting. We gotta get into this place. Eric Burdon and The Animals have shows coming on this Monday and Tuesday, February 15 and 16 at City Winery - Chicago. Completing the trilogy. My copy of Play On! - Power Pop Heroes Volume No. 3, with the colorful portrait of The Knack on the front cover, arrived in the mail the other day. Like its two predecessors, Volume No. 3 features author and successful critic Ken Sharp’s extensive and informative interviews with some of the best practitioners of power pop. Chicago is represented this time out by Off Broadway (Shoes, Cheap Trick, and Pezband were in Volume No. 2) with Sharp discussing the band’s history and records with with members Cliff Johnson, Ken Harck, Rob Harding, John Ivan, and John Pazdan. Other acts covered in this volume include The Romantics, Rockpile, Greg Kihn, 20/20, The Beat (Paul Collins version) The Knack, and The Plimsouls. There’s an extensive interview in Volume No. 3 with Peter Case, who in addition to being a founding member of the The Plimsouls, also formed The Nerves with Paul Collins. Case will be performing tomorrow night, February 13 at the Old Town School of Folk Music. 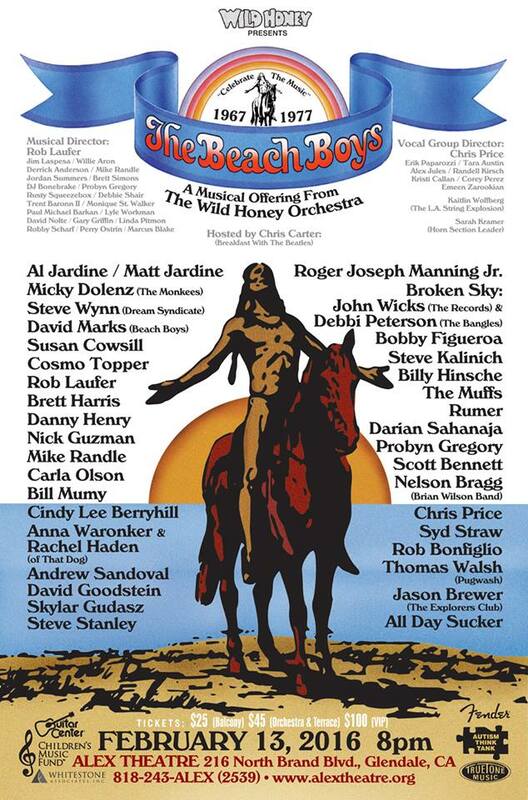 The Wild Honey Foundation, a charitable organization that certainly knows its way around power pop, is offering the Beach Boys 67 — 77 Show Fundraiser at the Alex Theatre in Glendale, CA tomorrow night, February 13. It will benefit the Children’s Music Fund and the Autism Think Tank. Chris Carter, who does a Breakfast With The Beatles radio program, will serve as host, and he’ll be joined by The Wild Honey Orchestra. Recent addition Mike Mills will join a roster of musicians including Al Jardine, Matt Jardine, Micky Dolenz, Steve Wynn, Susan Cowsill, Carla Olson, Broken Sky (featuring John Wicks and Debbi Peterson), The Muffs, members of Brian Wilson’s Band, and Syd Straw. There will also be some Monkees items, autographed by Dolenz, available at the show. Vinyl, the Martin Scorsese/Mick Jagger produced drama, kicks off this Sunday night at 9:00 PM, February 14 on HBO. The show is set in the 1970s, and concerns a down-on-his-luck record company executive trying to draw renewed energy by tapping into the new punk and disco genres. Meredith Blake’s interview with Jagger in last Sunday’s Chicago Tribune, along with the trailers on the official website, make this look like a promising new series. The Sirens Of The ‘70s tribute act will present its Ladies Of The Canyon Salute next Thursday, February 18 at FitzGerald’s in Berwyn. BeatleJuice, the nine-piece band that won the Battle Of The Beatles Bands competition at last year's Fest For Beatles Fans - Chicago, will be performing next Friday, February 20 at Peggy Kinnane’s in Arlington Heights. Kevin Lee has worked with a number of talented musicians while recording and performing throughout his career, and he continues to make new connections. The Chicago singer-guitarist recently announced on Facebook that guitarist Michael J. Kurtz and bassist-vocalist Patti Prendergast have joined his band The Kings. 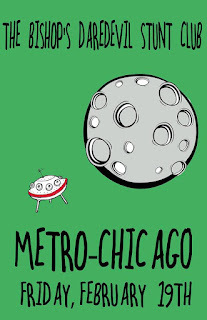 The Chicago Architecture Foundation is seeking local artists to help create a graphic novel interpretation of The Wacker Manual, a vintage textbook that first appeared in Chicago schools in 1911. The manual’s objective was to enlighten kids to the benefits of the 1909 Burnham/Bennett Plan for urban design. The chosen artist or artist team will work with the Chicago Architecture Foundation on creating a more hip-looking version that will be released this summer. The project is part of a 50th Anniversary celebration for The CAF. Los Lobos will tap into their impressive repertoire of songs like “Will The Wolf Survive,” “Shakin’, Shakin’, Shakes,” and “Set Me Free (Rosa Lee)” when they perform on Sunday, February 21 at the McAnnich Arts Center at College of DuPage. They’re sharing the bill with special guests Ballet Folklorico Mexicano. The Signal Ensemble Theatre’s critically acclaimed production of Heidi Schrek’s The Consultant runs through next Saturday, February 20. As reported by theatre critic Chris Jones in this past Wednesday’s Chicago Tribune, The Second City comedy institution plans to add the Harold Ramis Film School as part of its training facilities starting in September. The school, named in honor of the late actor/director and Second City alumnus, will focus on creating screenplays, comedy pilots, and other types of scripts. Dave Stewart, who gained fame as half of The Eurythmics with Annie Lennox before moving on to a career as a high-profile producer, has joined the ranks of Chrissie Hynde, Elvis Costello, and Tom Petty as rock stars writing memoirs of how they started out in the late 1970s. Stewart’s autobiography, Sweet Dreams Are Made Of This - A Life In Music is now available. The challenge in judging this new mostly acoustic and low-key solo effort from Christopher David is that it's so far afield from his work with the indie rock band Magatha Trysty. Plus, much of that band's appeal stems from the dynamic vocal interplay between David and singer-keyboards player Catherine Louise. When you're used to high-powered gems like "Clairvoyant," it's hard not to approach a project like this with a bit of caution. But David has always shown a knack for creating strong melodies and intriguing if sometimes cryptic lyrics, and that talent continues in abundance on The Houdini Tapes. The album ends with a pair of songs that are a bit too sedate, but prior to that, there's an entertaining mix of ballads and more energetic tracks that finds David broadening his approach. On "Easier To Run," he adds a touch of synthesizer to an easy-going arrangement, and the imaginative fable "Black Crown" has the feel of a classic rock ballad. "Before And After The Crash" is a tuneful and heartfelt look at a crumbling relationship from a guy who wonders if there ever was anything real about it. "Crime Of The Century," with its fuzzed-out electric guitar and driving beat, and the abrasive "Something Better" provide some harder-edged excitement, but even without them, The Houdini Tapes would be an engaging and successful side project. Christopher David has a release party for The Houdini Tapes coming up on February 27 at The Elbo Room on Lincoln Avenue. Out in California, the Wild Honey Foundation has developed a terrific formula of staging concerts to help worthy causes. In the past, Wild Honey has recruited some of alternative rock and power pop’s brightest stars to perform Beatles or Big Star albums in order to raise money for medical research, education, and musicians who need help paying medical astronomical bills. Many of the participants are Wild Honey veterans and judging from the comments and clips that show up on social media afterward, it's obvious this foundation has a knack for bringing positive vibes to each of these events. 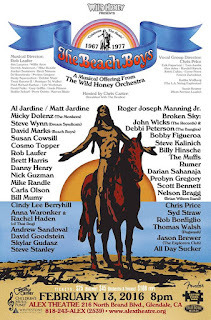 This Saturday night, February 13, Wild Honey Foundation is offering the Beach Boys 67 - 77 Show Fundraiser at the Alex Theatre in Glendale, CA to benefit the Children's Music Fund and the Autism Think Tank. Chris Carter, who does a Breakfast With The Beatles radio program, will serves as host, and he'll be joined by The Wild Honey Orchestra. The musicians involved include Al Jardine, Matt Jardine, Micky Dolenz, Steve Wynn, Susan Cowsill, Carla Olson, Broken Sky (featuring John Wicks and Debbi Peterson), The Muffs, members of Brian Wilson's Band, and Syd Straw. Tickets are $25 for balcony seats and $45 for orchestra and terrace seats. It would be nice if Wild Honey could brings its events to other cities, but I understand the travel expenses for all the musicians involved would be too high for the foundation to handle. Maybe if some promoters could help out with the costs, there would be a way to accomplish this. It would certainly be worth the effort. Here They Come. 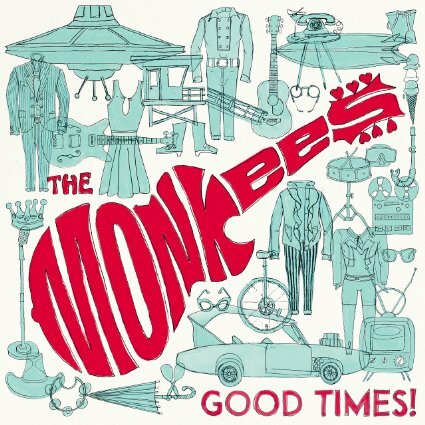 The Second Disc website is reporting that The Monkees will release Good Times!, their first album of new material in 20 years, on June 10. 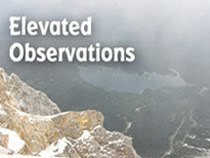 The concept behind this effort certainly sounds promising. Some of the songs have been written especially for the band by current artists like Noel Gallagher and Ben Gibbards, while others will be composed by Neil Diamond and Carole King. The title track springs from a 1968 composition by Harry Nilsson, and will feature his voice along with Mickey Dolenz. So far, Mike Nesmith has not been involved in the project. Good Times! is being produced by Adam Schlesinger from Fountains Of Wayne, and arrives in time to help The Monkees celebrate 50 years of performing. Depending on when you're reading this, there might still be time to catch The Handcuffs tonight at the Township bar on Chicago's north side. They'll be sharing a triple bill with Razorhouse and the self-described power trombone trio Les Vikq. According to a recent issue of the Chicago newpaper Red Eye, this year's Grammy Awards ceremony will include a celebration of the impact David Bowie had on music, fashion, and culture. Lady Gaga, who has often cited Bowie as a major influence, will be a major part of the tribute. Two of the biggest names from Chicago's alt rock scene will share the bill on April 14 in the posh setting of The Civic Opera House. The Smashing Pumpkins will perform In Plainsong: An Acoustic-Electro Evening with special guest Liz Phair. Tickets went on sale earlier today. Tickets are now on sale for The Zombies show on May 29 at The Arcada in St. Charles. Founding members Colin Blunstone and Rod Argent, along with returning members Hugh Grundy and Chris White, will perform classic hits like "Tell Her No," "She's Not There," and "Time Of The Season," along with tracks from the recently released Still Got That Hunger album. Other upcoming shows at Arcada include The Bodeans next Friday, February 12, Creedence Clearwater Revisited on Febrauary 20, and a Rock Of The 80s triple bill of The Smithereens, The Motels, and The Tubes on April 8. The Hypocrites theater group will be staging local actor Hans Fleischman's inventive and critically acclaimed take on The Glass Menagerie at The Den Theatre through March 6. Fleischman's version of the Tennessee Williams play was a huge hit for the Mary-Arrchie Theatre a few years back. BeatleJuice, the nine-piece band that won the Battle Of The Beatles Bands competition at last year's Fest For Beatles Fans - Chicago, will be performing on February 20 at Peggy Kinnane's in Arlington Heights. Graham Nash's upcoming shows on May 11 and May 12 at City Winery - Chicago went on sale earlier this week. His new solo effort This Path Tonight comes out in April. Indie rock band Fort Frances will also be at City Winery - Chicago. They've got a record release party for Alio coming up on April 21. Tickets are also now on sale for New Order's upcoming gig at The Chicago Theatre on March 16. Metric has a gig next Friday, February 12 at The House Of Blues. The band is touring in support of its latest release, Pagans In Vegas. Peter Case, a founding member of the essential bands The Plimsouls and The Nerves, will be performing next Saturday, February 13 at the Old Town School of Folk Music. Chicago Blues: A Living History, a local ensemble of veteran musicians, is seeking to fund its third album Alive And Kicking via a KickStarter campaign. The two-CD set will come with a 36-page booklet, and feature Felton Crews, Billy Flynn, Johnny Iguana, Matthew Skoller, and Kenny "Beedy Eyes" Smith. Chicago Blues: A Living History is also dedicated to uniting older and upcoming musicians in order to honor the genre's history and secure its future. 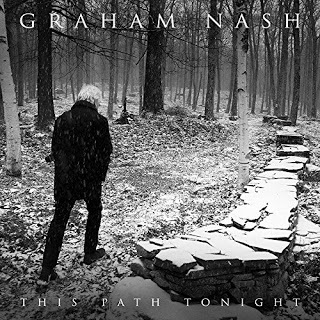 Graham Nash's birthday is a sort of holiday here on Broken Hearted Toy, and this year it arrives just as he's about to kick off a world tour. This Path Tonight, his first solo effort in 14 years is due out in April. Touching The Flame, an exhibit that covers Nash's entire career dating back to The Hollies, runs through March 20 at The Rock And Roll Hall Of Fame. So what better way to celebrate the man's birthday than to buy stuff from him? Tickets for his May 11 and 12 shows at City Winery - Chicago officially go on sale tomorrow, but quite a few have already been snapped up via pre-sale opportunities during the past two days. This Path Tonight, which comes with a DVD, is available to pre-order on Amazon. The Rock And Roll Hall Of Fame is selling a Touching The Flame t-shirt, and you can find t-shirts, vinyl, CDs, and other items on the official Graham Nash website. If you’ve read Graham Nash’s autobiography Wild Tales or Ken Sharp’s interview with him in the limited-edition book Play On! Power Pop Heroes - Vol. 1, you know he enjoys sharing entertaining anecdotes about his life. Occasionally, the way he remembers something isn’t quite the same as the way Stephen Stills, David Crosby, or his fellow band mates in The Hollies, Allan Clarke and Tony Hicks remember it. Who can really say for sure at this point? I did a telephone interview Nash for the Illinois Entertainer in 2009, and he came across like a guy hanging out with his mates in a pub. We talked about how The Hollies deserved to be in The Rock And Roll Hall of Fame (they hadn't been inducted yet at that time), his political views, and how he finds inspiration for songs. My favorite part was when he described how the idea for "To The Last Whale" came to him while he was sailing with David Crosby. And yes, I have a ticket for one of his City Winery - Chicago shows. The guys in Trolley haven't lost a bit of the craftmanship that made their 2011 album Things That Shine And Glow so enjoyable. (It was a Broken Hearted Toy Top Ten Favorite of the year, and perhaps more importantly, the track "I Woke Up" was tapped as one of Little Steven's Coolest Songs In The World on his Underground Garage radio show.) Caught In The Dark finds the Milwaukee-based band taking the same multi-dimensional approach it did on Things. Guitarist Paul J. Wall, keyboards player-guitarist Mike Perotto, and bassist-guitarist Terry Hackbarth can all sing lead, and the arrangements they create together are consistently inventive. Most of the 12 tracks hit the ground running, particularly the catchy "Thursday Girl," which features electronically altered guitars and vocals, and the title track. An obvious 1960s influence once again comes into play, but Trolley uses that era as a launchpad rather than getting bogged down in tepid imitations of decades-old material. "All The Way" has a vintage (pre-disco) Bee Gees vibe but there's also a modern-edged instrumental passage. The triumphant "She Helps Me Celebrate" also breaks loose at midpoint, while the introspective "Losing That Madly In Love With Her Feeling" serves up some of the album's most exquisite harmonies. "She Has It All" throws another curveball the listener's way by adding a bit of 1980s new wave, while "We All Fall Down" and "The Kids All Sing" are straight-up power pop gems. The extended keyboards coda at the end of "Take My Love" is a gamble, but by that time, Trolley has given the song an alluring psychedelic landscape that makes it work. Also, it's a fitting end to an album filled with adventures.